Spring Mario is one of Mario's forms in Super Mario Galaxy and Super Mario Galaxy 2. In both games, he is able to transform into it by collecting a Spring Mushroom. In Super Mario Galaxy, the form first appears in the Toy Time Galaxy, and later in Matter Splatter Galaxy and Beach Bowl Galaxy (only in the Purple Coin mission "Beachcombing for Purple Coins"). As Spring Mario, Mario is able to jump higher, but is no longer able to run. Instead, he simply bounces around the level. Using this form, Mario is able to bounce very high to reach items hidden in the air. It also grants him the power to climb very steep inclines in a slinky-like fashion. The player can make Mario jump super high by pressing the A button at the moment Mario lands. Its disadvantage is the control; movement is difficult in this form, making it easy for Mario to fall in space or falling into hazardous places. If Mario takes damage, touches water, or lands on a Launch Star or Sling Star, however, the form is lost. Mario can still Ground Pound in this form. In Super Mario Galaxy 2, the Spring Mario form returns, behaving the same as it does in the previous game. Here, it makes its only appearance in Chompworks Galaxy in the "Spring into the Chompworks" mission. 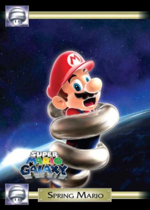 Many of the locations Spring Mario is intended to be used can be circumnavigated via sequences of Somersaults and Wall Jumps; it is in fact possible to collect every Power Star (including Green Stars) in Super Mario Galaxy 2 without collecting it once. BOING! Here comes Spring Mario after he grabs a Spring Mushroom in the Toy Time Galaxy. Use the fun Mario transformation to jump higher than ever before - and jump jump everywhere for that matter (Mario can't run as Spring Mario). Using the Spring Mushroom, Mario will be able to find hidden items in the air and climb steep levels with ease. In Wario Land II, Wario Land 3 and Wario Land 4, Wario possesses a similar form known as Bouncy Wario. 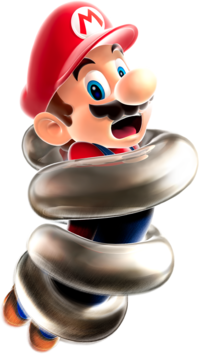 Spring Mario is the only power-up in Super Mario Galaxy with which Mario loses the ability to Spin. This page was last edited on February 4, 2019, at 02:09.